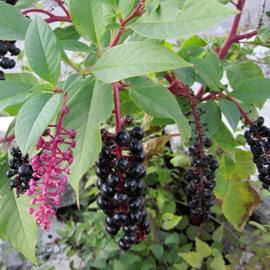 Pokeweed (Phytolacca americana) is a poisonous plant native to the southeastern U.S. with a long and interesting history. In the campaign of James K. Polk, the 11th US president, the leaves were reportedly worn by his supporters, and was therefore called Polkweed. The original name is derived from the Algonquin word ‘pakon’ or ‘puccoon,’ which meant roughly a dye plant used for staining. Though all parts of a pokeweed plant are poisonous when raw, freshly cut young leaves may be twice boiled and eaten like spinach, and the plant is sometimes canned and sold commercially. In 1969 the song “Poke Salad Annie” was on the airwaves. Despite all these claims to fame, we are quite certain that pokeweed should remain in its native range. Pokeweed’s root and leaves are the most toxic, but even the berries of the plant have caused vomiting, spasms, and even death in humans. It can also be a problem in pastures where it is toxic to cattle, sheep, turkeys, swine, and horses. However, birds are immune to the poisons in the plant and are a major factor in the plants dispersal. 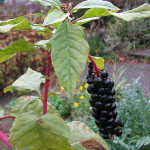 Pokeweed is rapidly increasing its abundance in urban areas, mostly in Portland, and is poised to continue moving outward if not controlled. 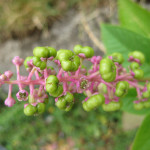 Because of the danger of human poisoning, pokeweed should be eradicated when discovered, especially in gardens or areas where children may be tempted by its attractive berries. Unfortunately, Pokeweed is not the easiest plant to kill once it establishes. It has a very large taproot, growing up to the size of a bowling ball, and can re sprout from this root. 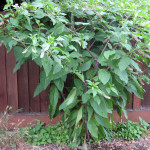 Pokeweed branches extensively and can grow up to 8 feet tall. Pokeweed growing in urban areas does not often reach full size. Purple berries and bright green, egg-shaped leaves make Pokeweed easy to identify. Pokeweed is a large herbaceous, perennial shrub that is very showy and hence very noticeable once you know what to look for. It has a smooth, stout, purplish stem that branches extensively and grows from 2-8 feet tall. The bright green, egg-shaped leaves are alternate on the stem and simple, with entire leaf margins. The white or green flowers form in elongated, clusters that hang from the branches. Flowers bloom starting in early summer and give way to distinct deep purple berries with crimson juice by mid-summer to fall. The purple berries hanging from the bright green leaves seen late summer are the most distinguishing characteristic of pokeweed. Its above ground growth dies back every winter, but it has a tremendously large white fleshy rootstock that allows it to survive and regenerate each spring. Its flowers form in long clusters, blooming in early summer, and give way to purple berries by mid-summer to fall. If you think you have found this plant please report it immediately. This plant is on our EDRR list, and we provide free control. Report a sighting!